With the arrival of spring comes lighter jackets, spring cleaning, and cheerful gatherings. This is also the perfect chance to refresh the decor in your home. Whether your family celebrates Easter or not, these spring table settings will inspire you to rethink how you decorate for the season. To add some elegance to a spring table, don't forget to pick up some taper candles. Match the candle to one of the main colors in the tablescape. This table setting features tones of turquoise blue and a soft lavender. If you want to create a colorful accent for a spring table setting, consider making these on-trend tassel placemats. If you can't commit to one color or pattern, mix and match because these placemats are reversible. To match farmhouse decor in your home, consider using natural wood toned elements like woven chargers. Also, place simple striped tea towels between the main plate and the salad plate to complete the look. Most spring centerpieces incorporate fresh flowers of some kind. Bring some of those flowers into your table setting by creating these floral napkin rings. For a no-fuss spring tablescape, pair some fresh daffodil centerpieces with brightly colored dip-dyed cloth napkins. The rest of the table can be set how you would for any other occasion with plain dishes and silverware. Most people don't think of royal and navy blue as a spring color, but this color palette works wonderfully for the season. Mix different patterns of toile blue together, and add in more spring inspired pastels into the centerpiece. The gold flatware makes this table setting seem extra luxe. No Easter tablescape is complete without a bunny or two. If you're entertaining for Easter, consider customizing small chocolate bunnies for each place setting. This is another clever idea for an Easter dinner. Wrap a hard-boiled egg in a cloth napkin to create a bunny. There's nothing wrong with keeping a spring table setting really clean and simple. To make the all-white palette seem more fresh and spring-like, incorporate touches like a crisp white linen table runner and fresh flowers. 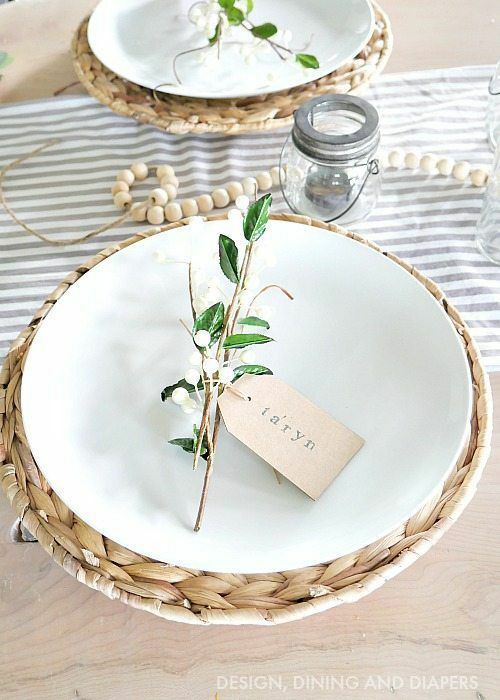 For a modern spring table setting, tie a basic name tag label to a single spring branch. To add a bohemian flair, sprinkle some wooden bead strands around the center of the table. For a table setting that guests will always remember, offer them something sweet before the main course. These place settings also have a more rustic feel with the addition of wood slice chargers above the woven ones. This place setting also offers guests something sweet before the main course, but the treat is more Easter inspired. Transform a cupcake into a bunny behind by adding a pink frosting tail and candy feet. This spring table setting incorporates decorative wooden eggs and fresh boxwood stems from the garden. If you don't have any boxwood shrubs, any leafy green will do, whether fresh or artificial. This floral napkin ring is similar to the project featured earlier, but it uses much larger blooms to create the ring which makes the look seem more whimsical. Pair the flower crowns with brightly colored dishware for a playful spring table setting. Lemons are fresh and perfect for a spring-inspired tablescape. To add a punch of color beyond the yellow lemons and green stems, fill glasses with some pink lemonade. This idea is really easy to accomplish for small gatherings, but it would also work well for spring weddings. When spring is in bloom, take advantage by gifting some mini blooms to your guests. The mini planters also make ideal place card holders. This spring table setting is soft and feminine, even with the unexpected pop of grey. Surprisingly, the light grey napkins with a frayed edge look beautiful against the cut crystal stemware. Just be sure to keep this table looking spring-inspired by adding a single tulip to each table setting and adding a brighter pink accent to the centerpiece. If you have a set of pastel cloth napkins, use that pattern to dictate the rest of your table setting. Or if you have a set of turquoise dinnerware, find a patterned cloth napkin to match. The easiest way to make your table setting fit into a certain theme or occasion is to buy patterned dishes. These bunny and cabbage plates work perfectly together. Love vintage charm? Create an eclectic spring table setting by visiting local antique shops and picking up miscellaneous floral plates and soft pink depression era glassware. What Plants Tell You That Spring Is Here?